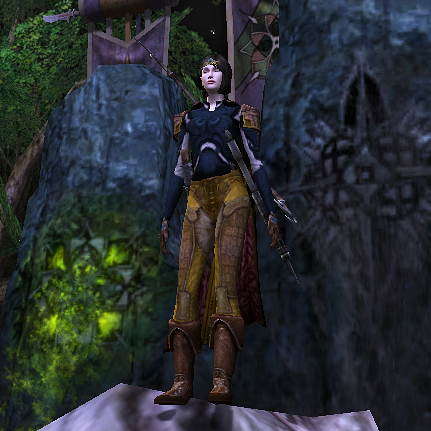 Sometime between Bree and the Lone-lands, Arestelle got a Mathom-hunter’s Jacket as a hobbit present, so swapped that in in place of the earlier dwarf-make shirt. The boots are from the Farmers’ Faire (Gardening Boots, sienna dye), cloak is another quest reward that’s also craft-able, circlet came from the gift box that new players receive on finishing the intro, and the shoulders are a basic low-level dwarf-make shoulder guard. It’s still rather a messy hodge-podge, but the Mathom armor looks better than a lot of what’s available at low levels (if only it could be dyed, or there were a dye that matched its color!). Also, as you can see from the presence of the horse’s stats in the screenshot, I was not yet aware of the function of F12. My screencap skills have improved since then. Promise. I swapped in the Leggings of the Eglain (gold dye, identical to some low-level crafted leggings) and a Fine Traveller’s Cloak (red dye, I believe) when I received those from a quest and a kinmate, respectively. 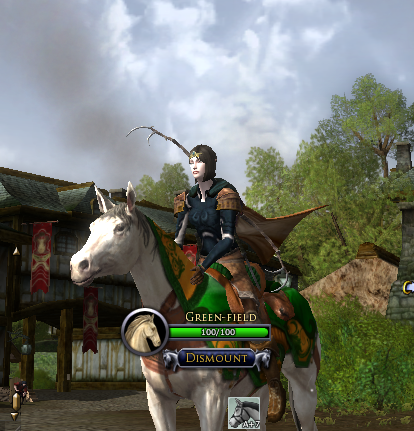 This entry was posted on 2014.03.17 by vyh in Outfits and tagged arestelle, blue, brown, cosmetics, elendilmir, equipment, gear, gold, lord of the rings online, lotro, mathom, outfits, sienna, teal.